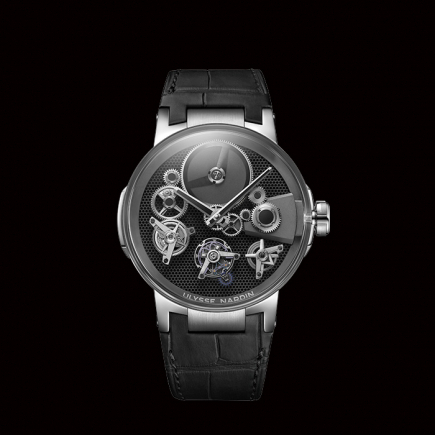 Ulysse Nardin | 310'000 € Tax inc. The Ulysse Nardin Marine Mega Yacht watch is a truly impressive and modern timepiece with a 44mm case in platinum and a highly sophisticated movement featuring a flying tourbillon and a power reserve of 80 hours. True to its longstanding tradition of building the most reliable marine chronometer watches, the Ulysse Nardin watch brand based in Le Locle, Switzerland, demonstrates with its new Marine Mega Yacht watch that it will always be able to adapt to its time. 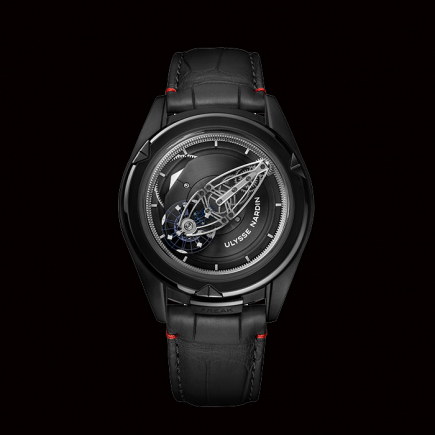 The Ulysse Nardin Marine Mega Yacht timepiece is a limited edition of just 30 watches that will adorn the wrists of only a few lucky megayacht owners. And just as any mega yacht vessel, the Ulysse Nardin Marine Mega Yacht watch needs to be seen in reality to grasp its true beauty and the level of complexity of its tourbillon movement, of its tidal calendar and of its audacious power reserve indicator. 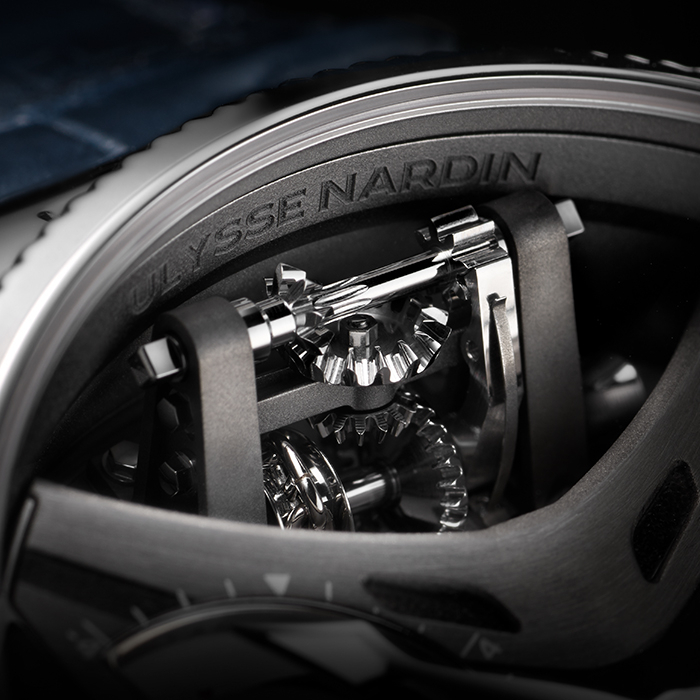 The new Marine Mega Yacht watch developed by Ulysse Nardin has no equal on the market. This mega timepiece in a prestigious platinum case proposes an innovative and audacious approach to nautical watches. Unlike other watches positioned in the same segment of luxury marine timepieces and who find their design inspiration in wooden decks and sails, the Ulysse Nardin Marine Mega Yacht watch adopts a resolutely modern approach for its dial and its movement, focussing strongly on the mechanical aspect of the yacht or preferably the mega yacht. The new Ulysse Nardin Marine Mega Yacht watch features a very original dial with varying shapes, levels, mechanical animations and colours, where the blue of the sea contrasts beautifully with the platinum of the case. The dial of the watch is dominated by a stylized prow in brushed white gold that generates a sense of speed as it cuts through the blue ocean, symbolized by the intense blue grand feu enamel dial. What makes the Marine Mega Yacht watch really outstanding is that on top of the usual moon phase, power reserve and hours-minutes indicators, this limited edition timepiece features a flying tourbillon. 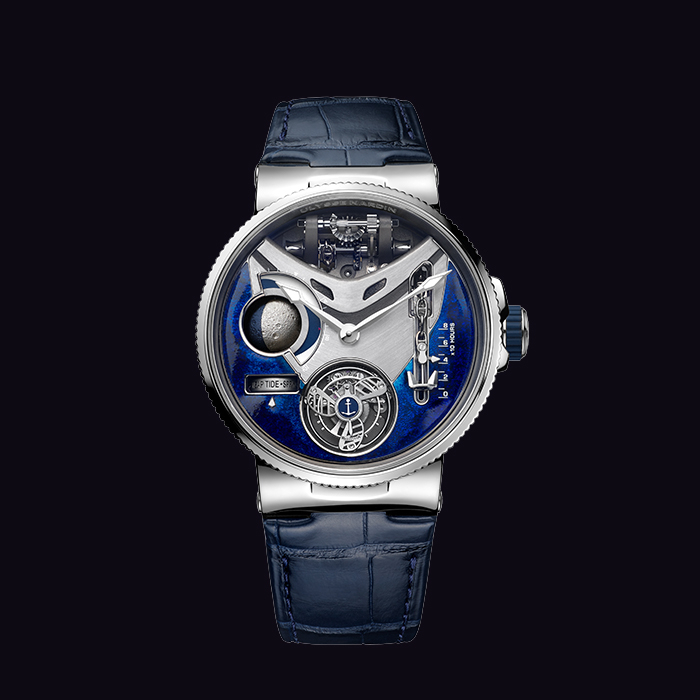 The tourbillon carriage features the rounded aerodynamic blades of a modern propeller. 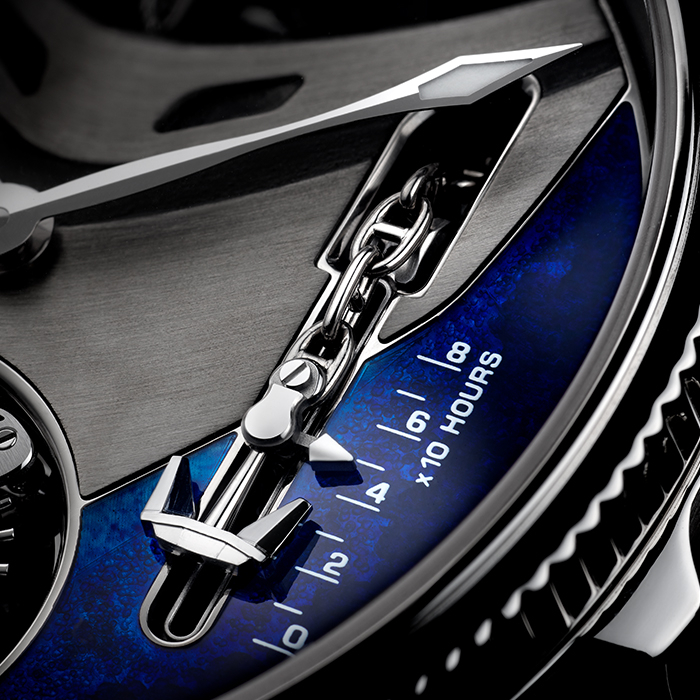 In its centre, the typical anchor symbol of Ulysse Nardin watches is placed on a contrasting blue background. 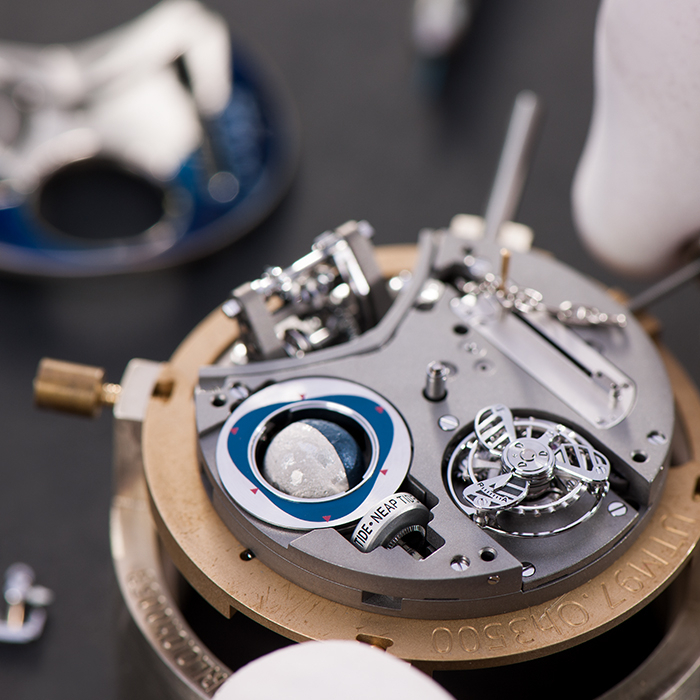 But this is just one of no fewer than 504 components in this ultra-complicated movement. Mega yachts are designed and built to offer a maximum level of comfort, but also to impress. In that respect, the Ulysse Nardin Marine Mega Yacht watch will be the perfect accessory for mega yacht owners who will be sure to impress when wearing such a watch, whether out in the blue sea or back on dry land. 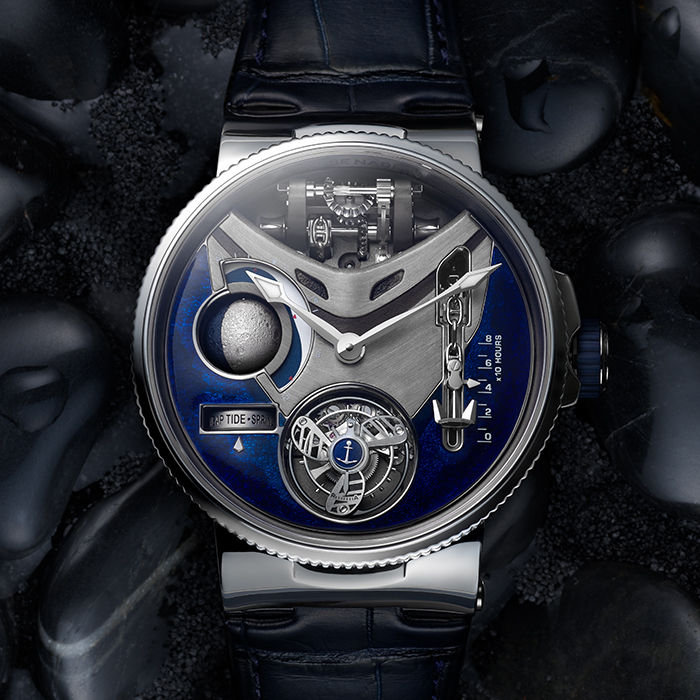 Apart from the stunning flying tourbillon positioned at 6 o’clock, the other impressive element on the blue dial of the watch is the very realistic, three-dimensional moon-phase display at 9 o’clock. Unlike annual calendar watches, the moon-phase movement complication represents a slower and more poetic interpretation of time. 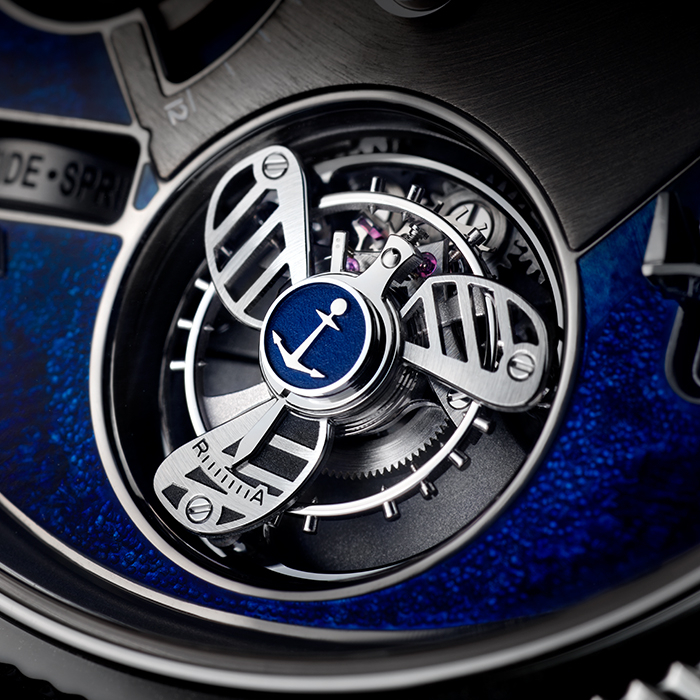 In the case of the Ulysse Nardin Marine Mega Yacht watch, the moon-phase movement complication stands out on the blue background of the dial and is accompanied by a sectorial tide height indicator and, underneath, a separate indicator for spring and neap tides, each of which occurs twice a month. 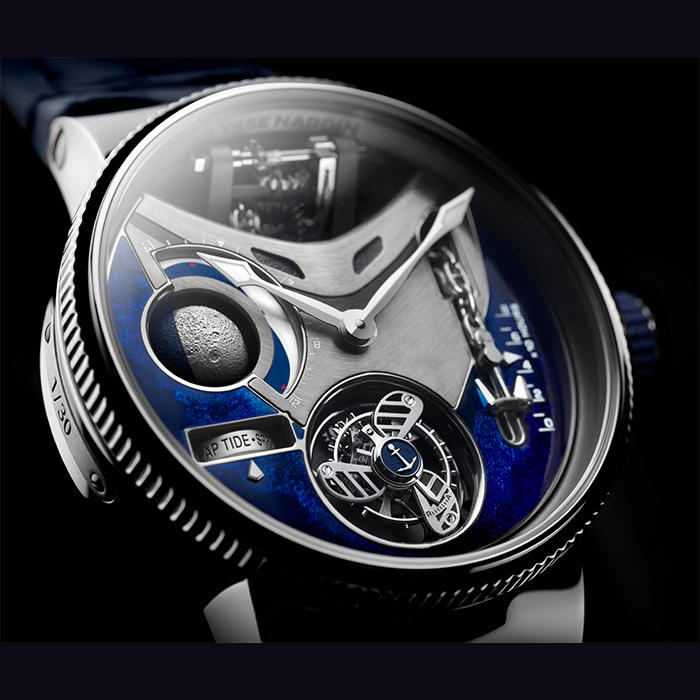 But probably the most impressive animation on the blue dial of this Ulysse Nardin watch is the patented power reserve display, positioned at 3 o’clock. 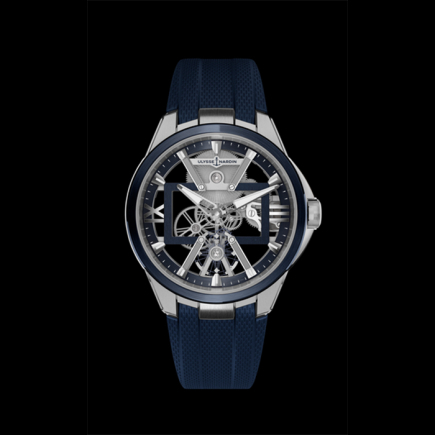 Never seen before on a marine chronometer watch, the Marine Mega Yacht by Ulysse Nardin features a three-dimensional anchor that will move upwards as you manually wind the watch with the crown on the side of the case. The anchor is attached to an impressive chain and a small arrow positioned just above the anchor indicates the remaining power reserve on a vertical scale. Fully wound, the Ulysse Nardin Marine Mega Yacht watch offers a power reserve of 80 hours. 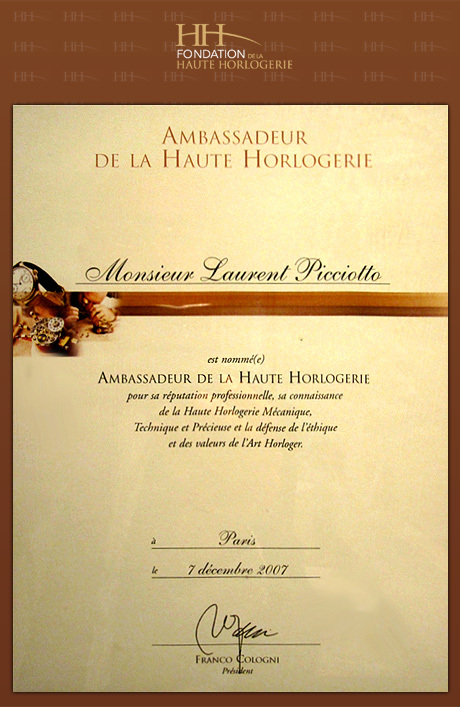 The platinum case of this prestigious timepiece is particularly impressive as it features a small window opening at 4 o’clock which reminds us the position of the crown (“S” for setting, “TM” for tide and moon setting and “W” for winding the (manual) movement). Mega yacht owners are also fond of personalization so the Ulysse Nardin Marine Mega Yacht watch will be custom-finished with a small plate positioned on the side of the case and bearing the name of its owner’s mega yacht. 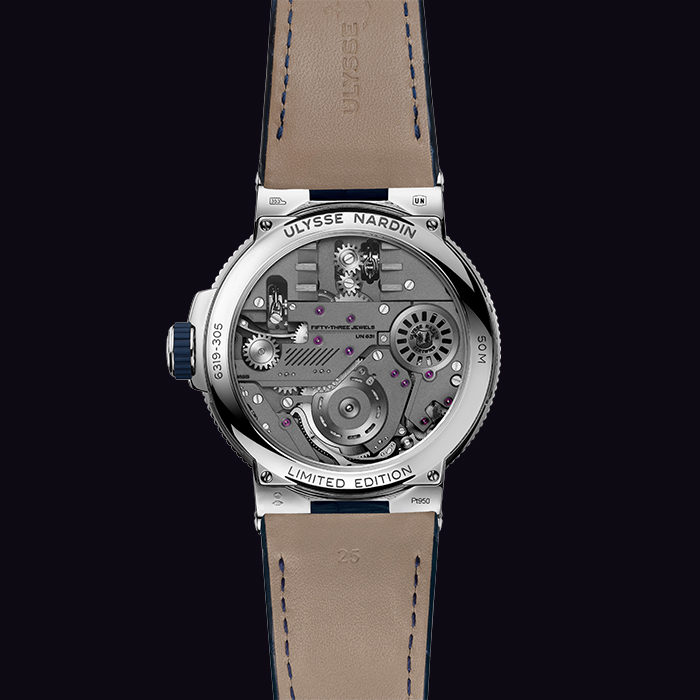 Last but not least, the movement, inspired by a ship’s engine room, can be observed through a large sapphire case back. The Marine Mega Yacht watch offers a fully integrated bracelet made of navy blue alligator leather.